Travel from Melbourne to Adelaide along the country's breathtaking south-east coastline. Take a ride through nature on the spectacular Great Ocean Road, which winds alongside the wild and windswept Southern Ocean. Drive the Great Ocean Road past the iconic surf spots of Torquay and Bells Beach, then onto the vacation haven of Lorne and the magnificent Twelve Apostles. Walk through waterfalls and lush forest in Otway National Park and watch whales from historic Warrnambool. Soak up seafaring history in Port Fairy and Portland, near the towering sea cliffs of Cape Bridgewater. Taste wine in Coonawarra and see the fossils of giant marsupials in World heritage-listed Naracoorte Caves. Cruise the Coorong and explore the inviting beaches and wineries of the Fleurieu Peninsula on your way to Adelaide. Drive into Geelong on the Bellarine Peninsula, where you can walk along the waterfront, visit local vineyards or swim from the beaches. Continue onto Torquay, where the spectacular, cliff-hugging Great Ocean Road begins. Torquay is also the gateway to Victoria’s Surf Coast. Visit the huge surfing museum and ride the waves of popular Jan Juc or iconic Bells Beach. Surf at Point Addis and Anglesea, where golfers share the scenic golf course with grazing kangaroos. The great waves continue at Fairhaven and Eastern View, en route to the seaside vacation haven of Lorne. 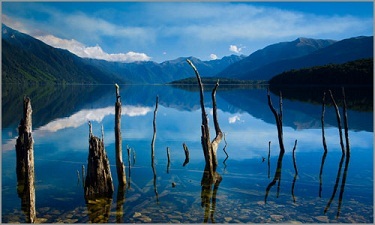 Swim from the golden beach of Loutit Bay and walk to waterfalls such as Erskine Falls tucked into the Otway Ranges. Trawl the galleries, boutiques and restaurants of the main street and drink coffee at one of Victoria‘s first cafes. Stay in a bed and breakfast, camping site or in luxury accommodation spilling into the surrounding forest. Day 2: Lorne to Port Fairy -Watch the rugged cliffs drop dramatically to ocean on one side and national park on the other driving into Apollo Bay. Explore the ancient rainforests, heathlands, glow worm caves and waterfalls of Great Otway National Park. Visit the 150-year-old Cape Otway Lighthouse and picnic at Paradise or Shelly Beaches. Curving round the coast, you’ll see the craggy limestone towers of the Twelve Apostles rising out of the Southern Ocean. Take photos from the boardwalk or Gibson’s steps and wander the paths at London Bridge, Bay of Islands and Loch Ard Gorge. Continue along Shipwreck Coast, named after the wild seas that sent at least 700 ships crashing on the rocks. Explore Warrnambool, where from May to October Southern Right Whales calve off Logan Beach. Soak up seafaring history in Port Fairy, with its old whitewashed cottages and Georgian-style homes. 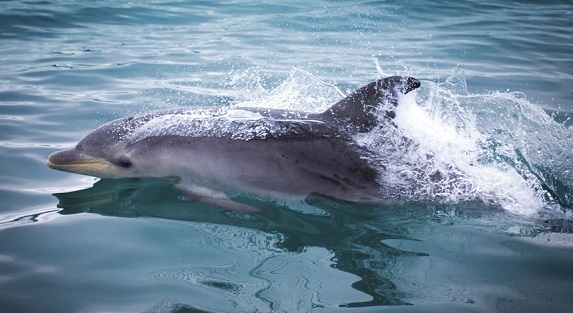 See Australia‘s largest fur seal colony and get up close to dolphins, whales and sharks from a boat. Day 3: Port Fairy to Coonawarra or Robe Continue along the coastal road to Portland, Victoria’s first European settlement. Check out the hundreds of heritage buildings and watch fishing boats unload their catch on the waterfront. Drive the scenic coastal route to rugged Cape Nelson State Park and the towering sea cliffs of Cape Bridgewater. Look over the deep-blue waters of Bridgewater Bay, explore a sand-petrified forest and walk around the cape to see the large fur seal colony. Back on the highway, drive through Nelson and across the South Australian border. Visit Mount Gambier, which sits on an ancient extinct volcano and is circled by crater lakes such as Blue Lake, named after the vivid colour it turns from November to February. Drive north to Penola and to Coonawarra, where you can sample cabernet sauvignon in some of the 20 cellar doors. Alternatively, drive through the fishing towns of the Limestone Coast to picturesque Robe. 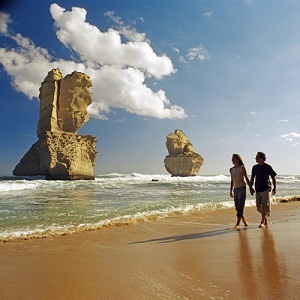 Dine on local lobster and swim or walk along Long Beach..
Day 4- Coonawarra or Robe to Victor Harbor Driving north from Coonawarra, visit the World heritage-listed Naracoorte Caves National Park, where the 26 limestone caves house the fossilised skeletons of giant marsupials. Cross the Murray River at Tailem Bend and head into the antiques hub of Strathalbyn on the Fleurieu Peninsula. From Robe, drive north through Kingston South East, where you can dine on fresh seafood and visit the historic Cape Jaffa lighthouse. Canoe or kayak along the shallow, salty lagoons of The Coorong, past a rich diversity of wetland birds. Learn about the area’s Aboriginal culture with a local Ngarrindjeri guide. Cross the Murray River at Wellington and head through Strathalbyn to the Langhorne Creek wine region and the historic river port of Goolwa. Surf, fly kites and spot southern right whales between June and September in Middleton. Swim in Horseshoe Bay and surf from Boomer Beach in Port Elliot, before driving into Victor Harbor. Day 5:V ictor Harbor to Adelaide Discover the attractions of the Fleurieu Peninsula on your drive into Adelaide. Take a horse-drawn tram to Granite Island to see little penguins or watch for migrating whales between June and October in Encounter Bay. Do the cliff-top walk to Port Elliot, then explore the streets on the Encounter Bikeway. Fish from the Cape Jervis jetty or hike part of the Heysen Trail along the coastline of Deep Creek Conservation Park. Drive along the Gulf St Vincent coast, stopping to swim at Sellicks and Aldinga beaches. Or travel through the rolling green hills of Mount Compass and Yankalilla to the McLaren Vale wine region. Visit galleries and taste wine in some of the 45 cellar doors. Stock up on olives, oils, cheeses, almonds and berries from roadside stalls and orchards before driving into Adelaide. Wander Adelaide’s cultural boulevard of North Terrace, walk and bike ride through the expansive parklands and enjoy the seaside ambience of Glenelg and Henley. Includes a car and accommodation.